Recent weeks have seen the introduction and review of laws designed to protect the operations of Australia’s immigration detention system, as well as the launching of the disturbing new Border Force agency. The Australian Labor Party (ALP) leadership also now look set to push through changes to their party’s position on boat turnbacks at their national conference this weekend, effectively adopting the position of the Abbott lead Coalition government. Various commentators have rightly decried the complicity of the ALP and their consistent capitulation to racism. However few if any have looked to explain this as action that helps to protect the investments that a sizeable number of unions have in the continuation of the detention industry. These investments are especially notable given various oppositional statements and activities that many of these same unions have made with respect to mandatory detention, an apparent contradiction that draws into question the strategic intent of such gestures. What does it mean, in short, to make a public statement of opposition to detention while at the same time remaining quiet about one’s role in financing this very industry? Or more directly, are unions indeed committed to ending detention or are they in fact hedging their bets? To summarise the point to be made here, Australian unions are a constitutive component of the border industrial complex. The actions of the ALP help to protect these investments and manage the risks associated. The investments of unions in the detention industry comes in the form of both financing detention centre contractors through industry superannuation funds as well as recruitment strategies directed at detention and immigration control workers. To this picture we can also add a number of social service and mental health organisations which play a role in either financing detention contractors or charity-washing for directors otherwise involved in the detention industry. The drawing of these connections not only provides a further explanation for the failures of the ALP but, more positively, maps a part of the detention industry supply chain that can be acted upon by members of a significant number of unions, industry super funds and non-government organisations. Operational Matters first reported on union links to detention financing through industry super funds on 30 January 2014, a day after Transfield Services announced plans to take over “Garrison Support Services and Welfare” at the Manus Island and Nauru detention centres. The signing of this contract, one of nine detention industry contracts and worth a total of $2.46bn, made Transfield Services the largest contractor involved in the running of offshore detention centres. An industry super fund is a non-shareholder fund managed by employer and employee representatives from a particular industry. The boards responsible for directing the investments of industry super funds are composed of an equal share of employer and employee representatives, which in most cases includes a significant share of union appointed representatives. Since 17 January 2014, investment manager Allan Gray had been declared a substantial shareholder of Transfield Services, with a share of over 18%. Allan Gray is an investment manager used by a number of industry super funds, including CBUS, REST, Hostplus, NGS Super, Maritime Super and Catholic Superannuation Fund, as well as Qantas Superannuation Plan (a corporate super fund). To date there appears to have been no change in this situation. Allan Gray remains a large shareholder in Transfield Sevices, with reports from February 2015 indicating a 19% stake. Allan Gray continues to be listed as an investment manager for CBUS, REST, Hostplus, HESTA, NGS Super, Maritime Super, Catholic Superannuation Fund and Qantas Superannuation Plan. In March 2014, Operational Matters detailed a number of investments by UniSuper, the fund for tertiary sector workers, in various companies with detention industry contracts including Transfield Services, Serco and Decmil. Industry super funds have also become substantial shareholders of Transfield Services in their own right. HESTA, the fund for health and community service workers, declared a more than 5% share in December 2014, which it held until moving below 5% in February 2015. REST, the fund for retail employees, became a substantial shareholder in June 2015. 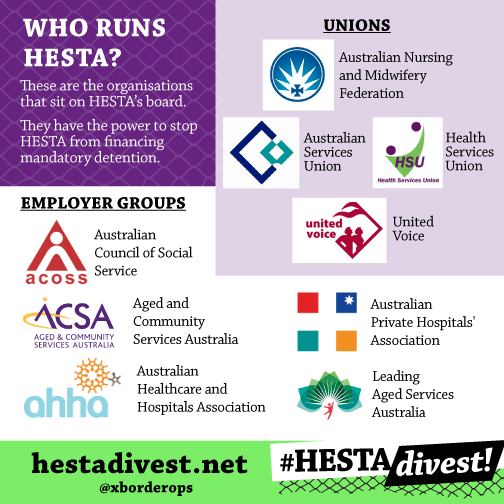 On 12 March 2014 the ASU national executive adopted a resolution calling for HESTA to divest from Transfield Services. The resolution appears to have been driven by Sally McManus, then president of the ASU’s NSW/ACT branch. McManus has since left the ASU for a position at the ACTU. Since McManus’ departure, momentum has stalled, with the ASU offering no public response to HESTA increasing its investment in Transfield Services to over 5% in December 2014. Following a resolution by the Victoria University branch in April 2014, up to five branches of the NTEU along with the National Conference passed calls for Unisuper to divest from detention centre contractors. In March 2015, Grahame McCulloch, NTEU General Secretary and Unisuper director, stated that Unisuper no longer had any “exposure” to Transfield Services. No mention was made of connections to other contractors nor was guarantee made that Unisuper would not reinvest in Transfield Services. Following McCulloch’s statement, the campaign for divestment within the NTEU has effectively come to a standstill. The most recent call for divestment from within a union came in June 2015 with a motion from Tara Nipe passed at the Australian Nursing & Midwifery Federation (Victorian Branch) Delegates’ Conference. While a much welcome development, signs of resistance from ANMF leadership – Brett Holmes, General Secretary NSW Nurses and Midwives’ Association and HESTA director, has previously defended HESTA’s investments – suggests the need to continue building focused and sustained pressure. 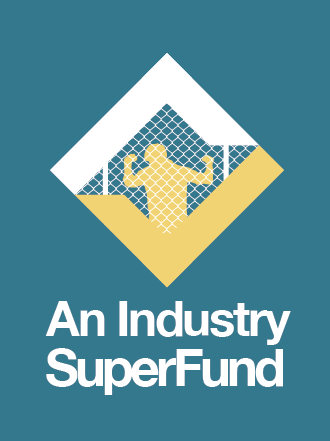 In summary, despite much effort on the part of both union and non-union organisers, no industry super fund has yet declared that it has completely and permanently divested from detention. United Voice has been organising detention centre workers, including guards, since 2009. As the numbers of members working in detention centres has grown, sources from inside the union have noted a diminishment in the union’s public opposition to detention policies, including an effective silence over laws that give stronger protections to guards to use deadly force against detainees. United Voice has also taken positions against the closure of onshore detention centres in Tasmania and Darwin. The recent amalgamation of Customs and Immigration into the Australian Border Force drew the CPSU into dispute with the government over the termination of the Customs enterprise bargaining agreement. This campaign, however, should not be mistaken as resistance to the running of Border Force operations as such. As has been the case with United Voice, industrial action of this kind helps the union to both retain and increase its membership base in this industry. The point that requires underlining in both of these cases is that open opposition on the part of a union to either a government employer or detention contractor cannot be read as opposition to the industry itself. As the position taken by United Voice with respect to onshore detention centres demonstrates, unions who receive revenue from members who work for the detention industry establish a vested interest in its continuation. As is the case with police unions, unions who represent the interests of border control workers also develop an interest in protecting their members from the consequences of the violence that is inherent to their work. There are a number of known connections between the detention industry and various social service and mental health organisations. The Australian Council of Social Services (ACOSS), representing a large body of health, community, and social service organisations, has a representative on the board of HESTA. Angela Emslie, the independent chair of HESTA, is also a director at Suicide Prevention Australia. REST is a corporate partner with headspace, the National Youth Mental Health Foundation. Douglas Sneddon, a director of Transfield Services, is also a director at the Black Dog Institute. The founder and chair of Beyond Blue is Jeff Kennett, a former Premier of Victoria, who expressed support for offshore camps and at one point suggested the parents of children in immigration detention were to blame for the mental health conditions of child detainees. The ALP has been integral to the continuation of mandatory detention since it introduced the policy in 1992. Recently the ALP has been involved in either passing or negotiating changes to laws related to the detention industry which can be read not simply as a capitulation to the Coalition but also as a means to shore up the various investments of unions detailed above. In late June 2015, the Coalition and ALP scrambled to pass legislation to secure the funding of mandatory detention in response to a high court challenge that threatened to rule the existing contractual arrangements illegal. The ALP has also helped to pass a new law that criminalises detention centre staff who speak out about conditions in detention centres, over which health care professionals and child care protection bodies have expressed serious concern. As these laws continue the process of militarising Australia’s border control system, they also help to protect the financial and reputational interests of detention contractors by censoring whistle-blowers. In effect, these laws complement the already existing practices of Transfield executives under Senate committee review. The position of the ALP has been to push for amendments to the bill rather than opposing it outright. The bill has the potential to protect United Voice staff and detention centre contractors from being found criminally liable for the violence inherent to the running of detention centres. In finance, “substantial shareholder” is a technical term referring to a company or individual who owns more than a 5% share in a company. Becoming a substantial shareholder carries disclosure obligations, meaning that details of the shareholding must be announced to the ASX.